During the period covered by the latest weekly US Mint numismatic sales report, the proof version of the Mary Todd Lincoln First Spouse Gold Coins sold out. These coins had first been offered by the US Mint on December 1, 2010. Both proof and uncirculated versions were available, originally priced at $854 and $841, respectively. During the course of the offering, prices varied based on the average weekly market price of gold. The most recent price for the proof coin was $1,054. 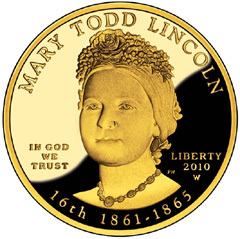 The uncirculated version of the Mary Todd Lincoln Gold Coin sold out after six months of availability on June 1. This was finally joined by the proof version of the coin on November 9. The last reported sales were 6,909 proofs and 2,760 uncirculated coins, for a combined total of 10,669 compared to the maximum authorized mintage of 20,000. The US Mint does not always produce numismatic products to the extent of the full maximum mintage. In this case, they presumably struck a certain number of coins prior to the close of 2010, which continued to be offered for sale throughout 2011. Some First Spouse Gold Coins have remained available for up to one year after the original release date. Many of the more recent issues have sold out earlier. Elsewhere in this report, sales of the America the Beautiful Five Ounce Silver Uncirculated Coins have continued to slow. The US Mint now has three different designs available featuring Mount Hood National Park, Gettysburg National Military Park, and Glacier National Park. Sales were 205, 362, and 498, respectively, or 1,065 units across the three versions. The Mint has scheduled to release the next design in the series on November 29. I noticed that the Grand Canyon AtB has a ‘final’ mintage of 26,019. Do you know if this will get revised back up to 27,000? Or do you think it is due to the the finish issues discovered when it was released? thanks! Basically, yes I think it does have something to do with the finish issues, and I don’t foresee the sales numbers being revised back upwards. Thanks! I guess i should have looked at last weeks numbers before i posted. Doh! It does seem like that surge in sales the week of the 25th anniversary set release was a one off. I will be interested to see whether the Mint can achieve a sellout of Mount Hood before the new year begins. If we see sales of 200 coins a week, the number will be around 26,518, so we might see sales continue into January without another surge. I also noticed proof silver eagles are selling very well this year. I am not sure whether the 25th anniversary set numbers are factored into the 841,609 number listed in the report, but even if they aren’t, this is the fourth biggest year of sales on record and could potentially reach third. We have 6 sales reports to go. If we see 15K sales a week now until year’s end, it will pass 1987 and make it to third place with around 931,609. A really big surge of silver eagle sales, plus adding in the 100K from the 25th anniversary sets, might put it in contention for #2, though the surge in sales would need to be pretty big (a bit over 25K a week, which is unlikely to happen IMO). gold First Spouse Coins. The Proof and Uncir. seven hopeing for more First Spouse Gold Coins proud owner here. Hi, I am new at this, so please bear with me. Do you think the 2011-w american eagle’s finial mintage numbers will fall under the 2008-w $10 gold eagle mintage numbers of 8883? Or are they in the same class? I have a 2008-w and am hoping it stays as the lowest mintage W gold eagle but I am not sure if the 2011-w 1oz’s. are considered but I think they are. Does the mint up grade it’s mintage totals each week? Or will the 2011-w be sold past the year end? Thanks for any help here.